How to Reassess Your Chess (4th Edition). Type: BOOKS. Detail: Silman, J. Product Code: 9781890085131. How to Reassess Your Chess has long been considered a modern classic. This 4th edition takes Silman's groundbreaking concept of imbalances to a whole new level. 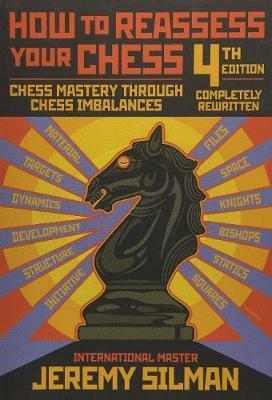 Designed for players in the 1400 to 2100 rating range and for teachers looking for a readymade chess curriculum, the author shares a mindexpanding journey that takes the reader through imbalancebasics, ensures that every detail of all the imbalances are mastered, and leaves the player/lover of chess with something he always wanted but never believed he could achieve: a masterlevel positional foundation. Hundreds of games brought to life by instructionrich prose, and stories that offer humor while highlighting various lessons, vividly illustrate all the book's topics in a manner that's both personal and fun. Jeremy Silman is an International Master and a worldclass teacher, writer, and player who has won the American Open, the National Open, and the U.S. Open.